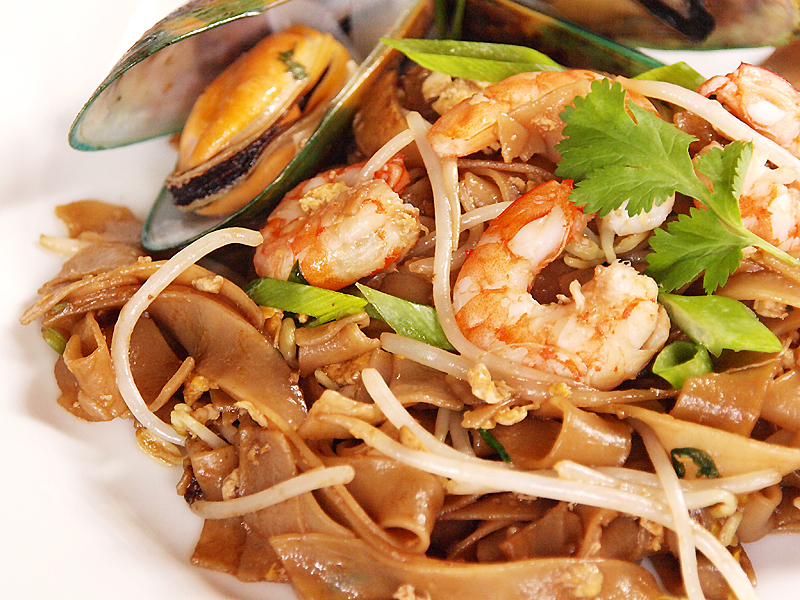 Char kuey teow in Chinese means “stir-fried rice cake strips” and this dish is very popular in South East Asian countries like Malaysia, Indonesia and Singapore. This dish as the name suggest is made out of flat rice noodles, this noodles are then stir fried in a wok in a very high heat using pork fat then flavoured with dark soy sauce, belachan (Malaysian shrimp paste similar to bagoong in Philippines), tamarind extract and variety of seafood such as cockles then finished with stir fried eggs. But the tradition of using pork fat as the oil was lost as this became popular in South East Asian Muslim countries. History says that this dish was invented for the labourers as the high fat content and cheap cost not is not just a cheap source of energy but as well as a good source of nutrients (from seafood), that’s why this dish was sold by fishermen which made this a source of a second income. And until now there are still some of those food hawkers left in Malaysia. Just go to Pasar Malams’ (Night Markets) and you shall see. Now due to the lack of ingredients here in New Zealand we have to improvise what’s available for us in the market so instead of using blood cockles we will be using mussels which are abundant here (normal cockles is out of season) and instead of the Sambal oelek we will be using a normal chilli paste. Soak the fresh noodles in warm water for 2 minutes to make it easy to separate by your fingers. Boil the mussels in a small amount of water enough to create steam and cook the shellfish. Once shells opened turn of the heat then set mussels aside. Also reserver 1/4 cup of stock. Prepare a really hot wok and add in your lard. Once smoking hot stir fry shrimps until it turns red. Add the noodles and add the fish sauce, dark soy sauce, light soy sauce and chilli paste, stir fry for 3 minutes. Create an open space in the middle to fry the beaten eggs separately and when cooked stir fry together with the noodles. Add the mussels, reserverd stock and stir fry for 1 more minute. Fold the scallions and bean sprouts into the noodles, the hot noodles will cook the vegetables. Turn of the heat and serve. I like the look of those rice noodles and fried in pork fat sounds great! Another fabulous recipe! Thank you. omg that’s the best part !! It’s getting harder and harder to find them now – healthy people are making them scarce but they taste so goooood. Those rice noodles look great… and I love mussels! !